A five-day, pirate-themed curriculum for use in Bible clubs and VBS. 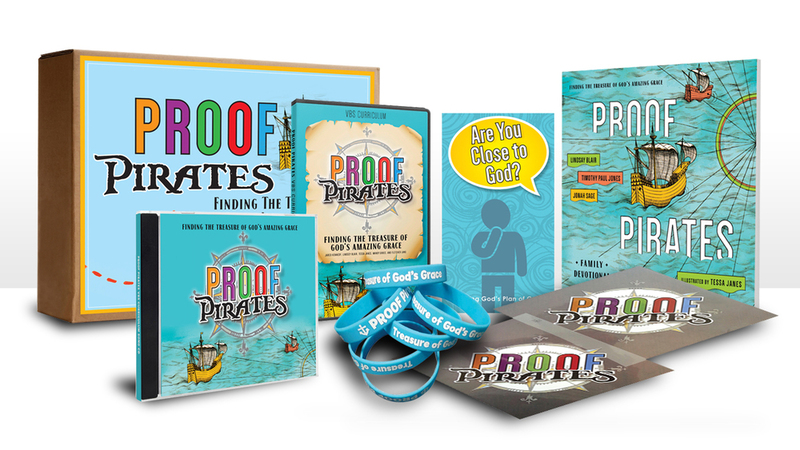 Whether using a treasure map to teach about God’s plan or a skeleton to explain how God makes dead people walk, PROOF Pirates helps kids uncover the treasure of God's grace. This family devotional introduces kids to God's amazing grace through a fun-to-read pirate story about a boy named Jesse whose parents send him on a scavenger hunt. Along the way, children will learn with Jesse key truths about God's grace using the popular PROOF acronym (God's grace is Planned, Resurrecting, Outrageous, Overcoming, and Forever). God's grace and not our performance makes us who we are. Explain the gospel of grace clearly and winsomely to children. Use the illustrations on each page to show and tell kids how God has come to us through Jesus, and how we can receive his love by saying yes to him and putting all of our trust in him. Click here to purchase the digital album and physical CD.